Questions have been raised about the use of expenses by elected officials after reports showed unusual discrepancies. In Reading deputy leader of RBC, Labour's Cllr Tony Page, defended his choice to claim nearly 20-times more in travel expenses than any other councillor - he said, "it may come as a shock... but [travel] does cost money." Cllr Page argued his claim was a "very, very low sum" which "represented excellent value for money." The millionaire property-speculator and freelance PR consultant - who has been a councillor for three decades since he was first elected aged 17 - explained he is Reading's official delegate on 12 outside bodies, roles which require him to attend meetings in London on average twice-a-week. He claimed £1,200 on top of his regular allowances of £14,000. He said, "obviously the cost of these trips are born by the council because they are council business... I think I'm entitled to be fed." 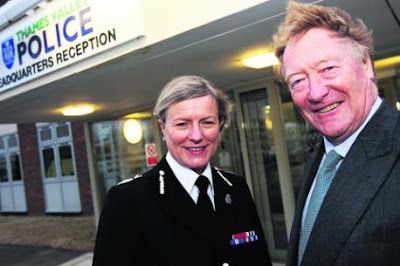 Thames Valley Police and Crime Commissioner, West Berks Conservative Cllr Anthony Stansfeld, hit national headlines for claiming inflated travel expenses - at the rate of £20.000pa to enable him to pay a retainer to a chauffeur - on top of his £85,000 PCC salary and £15,000 regular councillor allowances! After his election in November, Cllr Stansfeld took office and lodged a claim for mileage of £7.20 for 16 miles in January. This figure then rocketed by 6,000% to 1,005 miles and £452.25 in February and 1,334 miles at a cost of £611.90 in March. At a recent meeting of the Thames Valley Police and Crime Panel Buckingham Town Councillor Jon Harvey mockingly highlighted the expense claim by dressing in full driver's uniform and peaked hat, arguing it was out of touch with the current period of austerity. Conservative chums jumped to the PCC's defence. Panel member for West Berkshire Cllr Graham Jones called the criticism was 'ludicrously overblown', while Newbury's Richard Benyon MP gets things completely wrong by downplaying it as 'a ridiculous non-story' - overlooking the level of comment which brought the facts to the attention of this blog! Cllr Stansfeld denied setting up a 'sham office' to deliberately defraud tax-payers, saying his decision was designed to 'improve efficiency' - based upon making better use of his 'non-productive time' during the 35-mile journeys between the one-room PCC office he located at Hungerford Police Station and TVP HQ in Kidlington where the PPC's 13 dedicated staff are based. He commented, "I'm remarkably good value. If I hired myself out I'd charge a lot more." LibDem PPC for Newbury, Judith Bunting, weighed in rhetorically, asking if it is not appropriate for Cllr Stansfeld to be based where his staff are, then "maybe he would like us to make his life easier by moving the 13-strong team to Hungerford?" Cllr Stansfeld's expenses may initially appear contrary to election pledges to 'target the Police budget effectively' and 'offer great value for money'. Matthew Sinclair, Chairman of the Taxpayer's Alliance, said the "pop-up office appears to be part of a cynical scam to milk the system for as much cash as possible." Local Labour blogger, matthewsdent doesn't necessarily disagree, but does hold a low opinion of such arrogance. Calling Cllr Stansfeld 'a disgrace' and 'a law unto himself'. His witty retort however neglects the reality - the complaints recieved by the panel has initiated a formal investigation process into Cllr Stansfeld's expenses by an independent audit committee. Oranjepan says: It would be easy to speculate whether it is simple coincidence that a new development of 90 luxury retirement homes has been opened at Kintbury's Inglewood House by Audley Homes' CEO, Nick Sanderson, the Earl of Caernarvon - yet the above-named elected representatives are hardly living like monks! A 66-year-old former helicopter commander who served in Borneo and the Falklands War has been elected as the first Police and Crime Commissioner for Thames Valley Police, describing it as an 'honour' and a 'privilege'. Read more about his 'eclectic' background here. He highlighted the democratic nature of the position provides a direct mandate to get things done. "There is more of a public interface," he said. Turnout was 226,512 or 13.3% (1st preference; 12.9% 2nd preference). More details here and here. The successful Mr Stansfeld is currently a sitting Conservative Councillor for Kintbury ward on West Berkshire Council, and was a member of the 19-strong Thames Valley Police Authority which he will replace in the new role of Commissioner, stating "the most effective committee is a committee of one." "When the results came in I felt a mixture of relief and exhiliration, and also a certain amount of inevitable nervousness in taking on a job like this." Mr Stansfeld also defended the decision to politicise the election by running under a party banner, "There is nothing less democratic than an Independent, as no-one knows what he stands for." In total he gained 94,238 1st and 2nd preference votes from an electorate of 1.2m, coincidentally endorsing the supplementary voting system having previously rejected any electoral changes in the recent national referendum. The balance of results aligned closely with recent local council results, suggesting the outcome was based less on the issues of crime and policing than it was a reflection of current opinion towards Westminster parties. Right-winger Cllr Richard Willis gave his by-now expected preview of candidates, completely immune from all bias, of course! Luckily, Earley LibDems are able to fill in a few of the missing gaps for their party candidate. Elsewhere Whitley Labour party had a chance to listen to their candidate (who only recently joined the party after defecting). He talked about resisting cuts, and followed up with a perverse promise to remember to 'stay' independent. "It is now especially important that the new Commissioners work hard to offer great value for money, and to show how they can choose good Chief Constables, and influence police budgets and priorities in helpful ways." And in a post exhaustive and exhausting in equal parts, former Labour councillor John Howarth gets his excuses in early by blaming coalition members for his party's failure to win, calling the process a 'step backwards'. He states that Labour's critique of offering nothing more than a defence of the status quo was 'a woefully poor excuse' for democratic progressive party. With a complete lack of irony he argues the elections were 'unnecessary and inappropriate', adding that the massive PCC constituencies are too large to identify with, that a mid-November election was 'less than clever', and that his side apparently had insufficient opportunity to raise awareness of the issues. In contrast Adrian Windisch gets sanctimonious and over-emotional in his frustrated told-you-so rant from the sidelines, despite or possibly because of his party's refusal to invest in this democratic exercise. You can't complain about democracy if you don't participate in it! Meanwhile, via Facebook, former Police Officer Ruwan Uduwerage-Perera offered his condolences to his former colleagues and the public for the result, stating his expectation that Mr Stansfeld is unlikely to change from his usual practice of behaving like an 'absent landlord'. "If he tries to influence the policing of Thames Valley with his outdated, and ill-conceived opinions, then he will make policing worse." Finally, Alan Renwick, Reader in Comparative Politics at the University of Reading, throws his two cents into the mix. He looks at the number of spoilt ballots, and considers three reasons for this: confusion over the electoral system; dissatisfaction with the candidates; and disapproval of the elections themselves. However he concludes the case for deliberate spoiling of ballots is exaggerated, which may inspire lurid headlines of mass rejection of the process, but doesn't reflect the reality of low turnout and the actual level of political disengagement. As if to prove these professional and academic points, the successful candidate set up and operates a personal website to keep members of the public in touch and up-to-date with news and issues. Looking at the site, however, one might wonder at the new commissioner's commitment to fulfil this pledge: only one non-syndicated 'news' post (on 23rd July) and one modest 'article' (on 12th September) have been published so far. Similarly his twitter handle @StansfeldPCC showed initial purpose, but has lain dormant since he thanked well-wishers after his election on 16th November, and can clearly be seen now as more of a public relations/campaigning tool for him than as any serious exercise in democratic engagement. He can be reached by emailing info@anthonystansfeld.org.uk, but don't hold your breath. In a friendly interview with the Maidenhead Advertiser the Conservative Councillor for Kintbury blamed national leadership for his weak mandate, arguing that government failed to promote the role and didn't effectively communicate that devolving responsibility does mean depoliticising the Police - maybe they're yet to be convinced. With good cause... in a more neutral interview with Oxford Mail crime reporter, Ben Wilkinson, the tory politician refused to be held to his main commitment on cutting crime, saying this is dependent on outside factors such as the growing population and local licensing provisions. Or perhaps he'd been swiftly reminded of efforts made by TVP under current Chief Constable Sara Thornton since winter 2009 on his watch. Crime is falling consistently by year-on-year by averages of around 13% (April report, July report; official stats) precisely due to a direct policy choice - made during Mr Stansfeld's term on TVPA - to shift resources from crime detection to crime prevention as the means to retain public confidence while dealing with tight budget constraints following the financial crash of 2008. BBC Berkshire picks up on these public statements, and notes Mr Stansfeld's support for successive 2% and 2.5% rises in the Police precept of Council Tax in 2013 and 2014 to boost detection. This would effectively guarantee another year's pay freeze for TV Police officers while reversing cuts imposed by more senior members of his party, as he took a swipe at Maidenhead's Home Secretary, Theresa May MP... it looks like there may be trouble ahead! According to Mr Stansfeld, what the public wants is "an honest, fair and efficient police" which is polite and uses common sense and judgement. Would it be too much to ask the same from him, or is he only interested in re-election to this cushy number by pretending to be all things to all people? Oh dear! 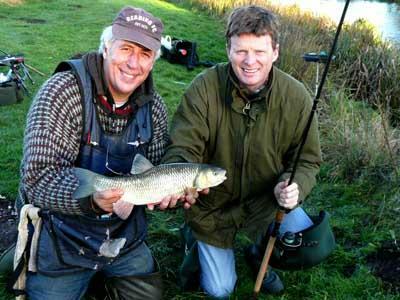 Newbury's Conservative MP and Defra Minister Richard Benyon keeps attracting negative headlines. On the day his department introduced the hosepipe ban The People's investigative team discovered a 15ft hosepipe 'gushing in the grounds' of his family's £125m, 20,000-acre Englefield estate. Mr Benyon responded in time-honoured fashion by threatening legal action, and filing complaints with Thames Valley Police over alleged trespassing on 6th April, as well as to the Press Complaints Commission for making false accusations. According to the Press Gazette, Mr Benyon decided to get into a war of words with the tabloid, accusing the journalists of breaking into his grounds and turning on the hosepipe - claims categorically denied by The People. Well, Mr Benyon is gracious enough to allow his magnificent gardens designed in 1601 by Sir William Norris to be opened to the public between 1st April and 31st October - provided members of the public pay a £3 charge! 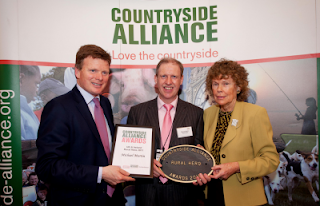 Is the Defra Minister an ally of the countryside? BBC Berkshire tries to get to the source: apparently the water minister didn't respond to enquiries at his mansion, or not until more than 1/2 hour after his head garden manager was informed that Mr Benyon was breaking the rules he is responsible for enforcing. Mr Benyon released a statement saying, "Neither I, nor my family, nor anyone who works for me turned that hose on," adding the implication that the journalists were responsible, as they were seen in the vicinity. To which the response came, they couldn't have reported the incident to his staff if they weren't nearby. Newbury Weekly News allows the local MP to gush forth defiantly: "I am comfortable with everything I've said in relation to the incident... I know where I stand." Yet The People says it may still seek legal action for the damage Mr Benyon has caused to the reputation of their cub reporter. Well, he can definitely afford any damages, as George Monbiot picks up, the hardline Euro-sceptic tory rakes in more than £200,000 in annual CAP subsidies from the EU, though he refuses to respond to enquiries about this contradiction. A further striking contradiction is noted by Michael McCarthy in The Independent, who picks out Mr Benyon's Who's Who entry listing his interests as 'conservation and shooting', whereas his department 'has been favouring shooting interests over conservation'. He states his opinion that Mr Benyon has not been a bad minister, but while he's been making positive noises on the international front regarding the ivory trade and rhino poaching, he has been far less balanced and impartial on the domestic front, among other things, by blocking the prosecution of a private grouse moor for damaging protected bogland. The Indy's environment editor follows up with a scorching attack against Mr Benyon for supporting a cull of buzzards - with shotguns - in order to protect pheasant stocks... for commercial shooting. His title is telling: Richard Benyon: The Bird-Brained Minister. And in a leader comment the paper gives it's own final blast: "it is as outrageous as it is incredible." George Monbiot rounds out a list of Benyon's bizarre decisions, locking his sights on the £375,000 which will be wasted by DEFRA on the buzzard blitz and taking aim at another discrepancy over the supporting figures used by the minister. Over at the RSPB's blog conservation director Martin Harper is understandable concerned, even taking time to read and quote some of the welter of negative comments on Mr Benyon's facebook page. Alarm bells are still ringing this week over ongoing backroom dealings regarding Common Fisheries Policy reforms, which would delay the repopulation of European fish stocks by 5 years, according to BBC Environment correspondent Richard Black. fishnews.eu reports on Britain's NFFO (National Federation of Fishermen's Organisations) support for the decentralisation of fisheries management, and Greenpeace activist Alicia C promotes the 'Be A Fisherman's Friend' campaign supporting sustainable fisheries by urging the public to send a 'sea shanty petition' to Mr Benyon to remind him of his responsibilities as Defra minister. Over at the Huffington Post, Shaughan Dolan is angered by the series of hypocritical decisions made by the Conservative MP for Newbury, asking "Is Benyon wilfully ignorant or just out of touch?" He argues Mr Benyon's behaviour 'smacks of incompetence', that he 'profiteers from greenbelt destruction' and has a 'shambolic knowledge of countryside ecology'. Shaughan suggests controversial Mr Benyon's position is becoming increasingly untenable with the growing levels of discomfort caused to Prime Minister David Cameron - according to him, Mr Benyon is clearly unfit to be a minister for Defra. Annabella Laws has started an official e-petition against Mr Benyon's proposed Pheasant protection scheme/Buzzard cull - you can read more and sign it here. For the complete list of current e-petitions to Defra click here. "it is a classic case of a minister so blinded by his personal enthusiasms that his political judgement deserts him completely." Update: Louise Gray at The Daily Telegraph reports that Defra has responded swiftly to public pressure and announced that it has shelved plans for a buzzard cull in what she calls 'an embarrassing U-turn'.